Good kitchen equipment is expensive but most items last a lifetime and will pay for themselves over and over again. …Delia Smith, English Cook and TV Personality. Commercial kitchen equipment need to produce food for a large number of consumers. It needs to be robust, durable, and easy to operate. The equipment should consume less electricity, improve the productivity of food production operations, and must be eco-friendly. Last but not the least, it should serve its purpose effectively. Most kitchen equipment are operated electronically. There is a wide range of cooking, cutting, baking, and cleaning equipment available for the kitchen staff. Let us introduce ourselves to some typical kitchen equipment. Here are some basic food production equipment. They are used for cooking, boiling, and steaming. They often operate on Liquid Petroleum Gas (LPG). Now induction burners and hot plates are available, which operate on electricity. They come with open top, mesh top, or flat top. Restaurant range − Less expensive, good for less food volume, and is stand alone. Heavy duty range − Expensive, suits a large volume of food production, and can be banked with other ranges using a battery. Cooking ranges come with multiple burners usually 4 to 8, depending upon the volume of food to be handled. They are used for cooking, baking, roasting, and browning. They operate either on LPG or electricity. There are various oven models such as Rack with the option of rotating or steady racks, Deck, and Tunnel depicting their shape and working style. Rack oven − It contains a set of stacked racks often placed equidistant, one above the other in a tall stainless steel frame. This oven is good to produce large volume of food items such as breads, cookies, and croissants. Deck oven − It contains racks or rotisseries that can cook various meats such as chicken, duck, lamb, etc. simultaneously and evenly. They also come in baking deck and pizza deck variants. The number of decks are generally up to four. Tunnel oven − It comes in direct heat and indirect heat variants. It is suitable for high temperature baking. There are myriad number of ovens available in the market, which vary according to the energy they consume, the manner of heating food, sizes, and shapes. They are flat plates made of iron, stainless steel, or aluminium, which transfer heat to the food. Griddles are prone to heat loss when the plate is partially unused. They are mainly used for preparing breakfast items such as omelets, scrambled eggs, patties, sandwiches, burgers, and pancakes. Normally, the residual grease needs to be wiped out occasionally from the surface to prevent tempering. In case of steel griddles, caramelization occurs if the surface is not kept clean. Teflon surface griddles are more durable and efficient. 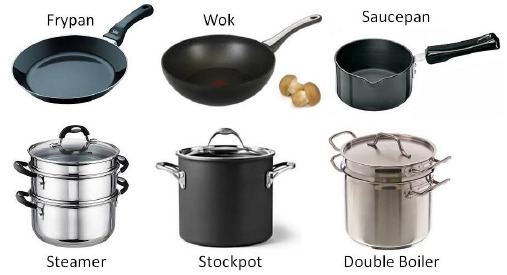 There are a wide range of pans, pots, and spoons used for cooking. Pans − Depending upon the type of cooking, the cook selects a pan. The pans serve the purpose of shallow frying, boiling, and stir frying. Pots − The pots are used for cooking and preparing stocks. They are generally accompanied with lids. The steamer is used to prepare steamed food such as rice, momos, and idlis (fluffy rice dumplings). There are two variants − shallow and deep. Spoons − The spoons help to check the thickness of liquids, tenderness of solids, stir, and turn the food in the pots and pans. 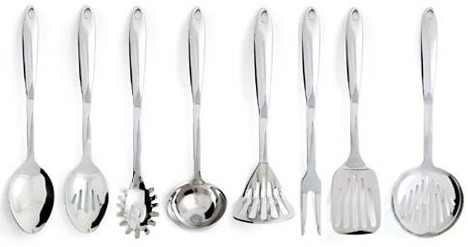 Various spoons used during cooking are skimmer, turner, masher, ladle, fork-spoon, and utility spoon. The kettles are used for cooking, warming, and storing food. They are two layered pots- one inside the other with a gap in between for steam. They are usually jacketed, agitator tilting for better view and food handling. The kettles also have a product discharge valve that provides an efficient transfer of kettle product to a service area without damaging delicate food items. 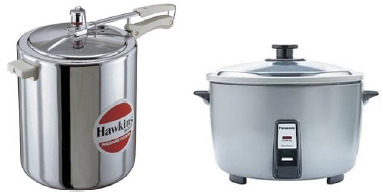 Deep kettles are best for soups, gravies, spaghetti sauces, pie fillings, and puddings as the quality of these food items remains the same irrespective of their volume and frequent stirring. Lentils, beans, and pasta can be cooked in deep kettles. The shallow kettles are best for cooking and warming stews, patties, steamed vegetables, where this kettle offers better view and less food handling. The cutters or choppers are used in cutting, dicing, shredding, and slicing vegetables in various shapes and sizes. They are also used to cut bread into small pieces for puddings or soups. The handheld cutters are used for cutting fruits, salads, etc. for presentation. Cutters are made of either plastic or stainless steel. Some cutters come with single or multiple wheels with zig-zag or plain edge. Some cutters have round small bowl-like shape to cut round pieces of fruits. The overhead motor vertical mixer is most commonly used in commercial food production units. Mixers are used for mixing and blending. 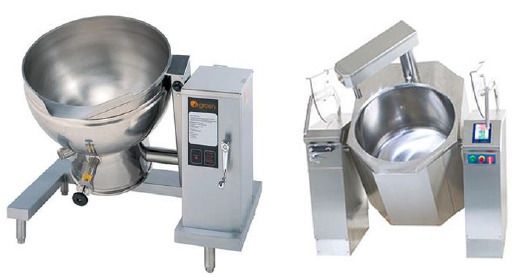 There are broadly two types of mixers − table mounted and floor mounted. Flat beater − Mashing and beating foods of medium consistency such as boiled potatoes. Wire whipper − whipping cream, eggs, frosts and other light foods that contain air. It works on high speed. Dough arm − It handles heavy and bulky ingredients such as bread dough at low speed. Commercial cookers and steamers largely operate on electricity. The cooks use these for cooking rice, lentils, and vegetables. The steamers are used for preparing steamed food such as Idli (a type of fluffy rice dumpling), momos, and dhokla. Some food items are prepared by immersing them in heated oil in a fryer. There are two basic versions of a fryer − Electric fryer and Gas fryer. The frying time and oil temperature varies directly with the food type and the size of the fryer. 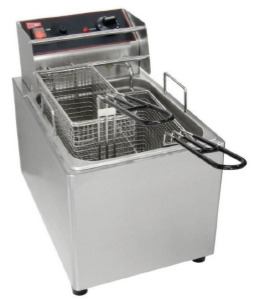 It consists of a fryer basket and heating element and a thermostat controls a fryer. The fryers are used to fry potato chips, Pooris (fried Indian bread), doughnuts, begels, onion rings, shrimp, fish, chicken, okra, and zucchini. Centrifugal − It works by crushing fruits. It is quick and yields plain juice. Masticating − It works longer to yield juice of specified texture and consistency. 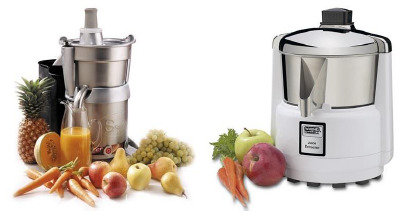 Twin-gear − It uses various gears and membranes to yield best quality juice of almost any fruit, carrot, tomato, or leafy vegetables. It also helps to prevent oxidation of the juice. It is very useful in preparing juices and pulps for breakfast, for meals as appetizers, and for using them in cocktails, mocktails, and smoothies. We will discuss here a few important maintenance equipment used in professional kitchens. Door-type − It is large machine. 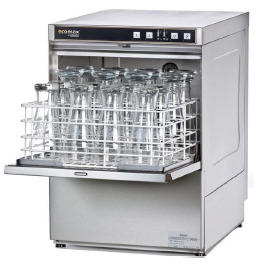 It can clean from 50 to 125 dish racks depending upon the size of the machine. Under-counter − It is smaller and can fit under the kitchen platform. Both dishwashers give sparkling clean dishes. It washes and dries almost 2000 glasses per hour. There are two types of glass washers − rotary and pass-through. They are mostly used at bars for washing glasses of various shapes meant for various beverages. It can dry as many as 1800 dishes an hour and eliminates the possibility of contamination caused by conventional drying methods. It conducts speedy washing of dishes. It also keeps the micro organic particles depositing at bay for long time. There are a few special equipment used in commercial kitchen to make the tasks easy. It is used to crack the shells of hard nuts such as almonds, walnuts, hazelnuts, pine nuts, palm nuts, and pistachio. Some machines are also capable of shelling watermelon and pumpkin seeds, and peeling peanuts, cashew nuts and almonds. A shredder cuts the fruits and vegetables into string-like fine pieces, which are useful in salads and vegetarian cookery. Paring knife − It is used for fine cutting work, removing onion skins, and cutting small fruits. Utility knife − It is used in general purpose cutting and scraping. Steak knife − It is used for cutting steaks. Chef’s General knife − It is a multi-purpose knife used on multiple commodities such as vegetables, fruits, meat, and poultry. Serrated knife (Bread Knife) − It has a long thin blade with serrated edge that provides sawing-like motion. It is used to slice certain foods with firm skins or outer layers such as bread, tomatoes, and capsicums. 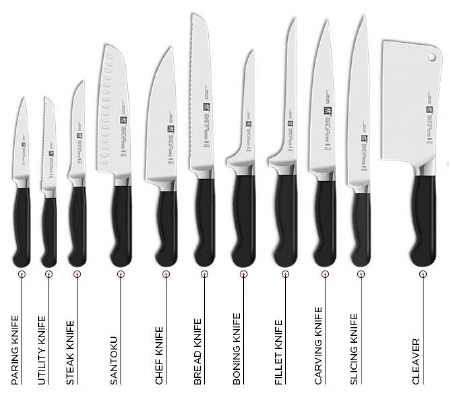 Boning/Filleting knives − They come with a narrow, sharp, and flexible blade and a protruding heel near the handle. They can run along the bones of flat fish or ribs smoothly. Carving knife − This knife comes with a long, thin and sharp blade to ensure neat and accurate cutting. Slicing knife − It has a long sharp blade that tapers at the end and helps slicing fruits and vegetables finely. Turning knife − It is an essential component to present the food in a unique way. This knife has a small curved blade that is used to carve the vegetables into the shape of a container. Cleaver − It is a butchers’ knife. It is very strong and sharp to cut through large pieces of meat such as pork and beef. Now let us see the fuels typically used in commercial kitchen for cooking. Fuel is a prime necessity in cookery. There are various types of fuels used for cooking food. Mainly two types of fuels are used in food production − Solid fuels and Liquid fuels. It can be acquired from logs, wood chips, and bamboo pellets. Seasoned logs are more popular in commercial kitchen as they contain less moisture. The more the moisture, more is the smoke created while burning. Though it is easily available, it requires a separate storage space at commercial food production end. Its calorific value is around 3500 Kcal/kg for moist wood and up to 4700 Kcal/kg for dry wood. It is obtained by slow heating of wood, animal or vegetable remains in the absence of oxygen. Charcoal is easily available and widely accepted as commercial cooking fuel. It produces less smoke than wood fuel. It also requires separate storage space. Its calorific value is around 7500 Kcal/kg. Solid fuels are useful in direct heating ovens, three stone stoves, tandoor, and barbeques. This fuel can emit carbon or ash particles while burning. Solid fuels give gradual heating. The initial cost is low. It also gives a tempting smoky aroma to the baked/roasted food. It is nothing but LPG, a mixture of propane and butane gases that exist in liquid state at room temperature. The LPG is highly inflammable and burns with a blue flame without emitting smoke, and it can be controlled precisely. Its calorific value is around 1000 Kcal/kg. It is also a petroleum product used in commercial kitchens for cooking. The liquid fuels produce heat almost instantly. The initial cost can be high. They are convenient to use but risky if proper safety precautions are not followed while handling these fuels. Though electricity is considered as an alternative fuel under energy power, it is the most commonly used heat energy for cooking. Most of the commercial cooking appliances operate on electricity. Electricity provides instant heating. The heat can be regulated as per the requirement. It is easy to access, though the initial cost of wiring may be considerable.